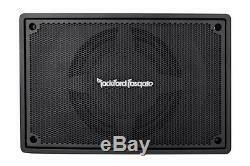 Rockford Fosgate PS-8 Single 8 Punch Powered Loaded Subwoofer Enclosure PS8. Single 8 Punch Powered Loaded Enclosure. The Punch PS-8 is an self-contained amplified subwoofer system featuring a single Punch 8 driver in a sealed enclosure and a built-in 150 watt amplifier. "Closed-loop" design ensures optimum performance between woofer, amplifier and enclosure. 150 Watt Class D Amplifier and 8 Shallow Woofer. Adjustable 12db/Octave low pass crossover. Built-in adjustable bass boost EQ. Remote bass level control included. Remote/DC Offset/Signal Sense turn on select. Short circuit, thermal, and reverse polarity protection. Quick disconnect power and signal connections. Includes all power, ground, and turn-on wires. Cast aluminum w/ ABS backplate. 14.4 x 9.4 x 3.3 (in) 36.5 x 23.8 x 8.3 (cm). NOTE: Any return that does not have a return authorization number written on the outside of the package will not be accepted. Sound of Tri-State has the sole discretion as to what is warrantied. It is our intention to keep you, the customer happy. After 14 days from your receipt date, defective items may be repaired or replaced at Sound of Tri-State's discretion Except Remanufactured products, which are only repaired. We have trained technicians on staff and ready to help with you with any questions. We are open Monday to Friday from 10 a. Office Addresss: Sound of Tri-State, 333 Naamans Rd. Ste 41 Claymont DE 19703. The item "Rockford Fosgate PS-8 Single 8 Punch Powered Loaded Subwoofer Enclosure PS8" is in sale since Tuesday, August 28, 2018. This item is in the category "Consumer Electronics\Vehicle Electronics & GPS\Car Audio\Car Subwoofers". The seller is "soundoftristate" and is located in Claymont, Delaware. This item can be shipped to United States.